A new method was used at the Ag 450 Farm Iowa State University (41.98N, 93.65W) from October 24, 2012 through December 14, 2012 to assess GHG emission from land-applied swine manure on crop land. Gas samples were collected daily from four static flux chambers. Gas method detection limits were 1.99 ppm, 170 ppb, and 20.7 ppb for CO2, CH4 and N2O, respectively. Measured gas concentrations were used to estimate flux using four different models, i.e., (1) linear regression, (2) non-linear regression, (3) non-equilibrium, and (4) revised Hutchinson & Mosier (HMR). Sixteen days of baseline measurements (before manure application) were followed by manure application with deep injection (at 41.2 m3/ha), and thirty seven days of measurements after manure application. Static flux chamber (pictured) method was developed to measure greenhouse gas emissions from land-applied swine manure from a corn-on-corn system in central Iowa in the Fall of 2012. Gas samples were collected in vials and transported to the Air Quality Laboratory at Iowa State University campus. Why Study Greenhouse Gases and Land Application of Swine Manure? Assessment of greenhouse gas (GHG) emissions from land-applied swine manure is needed for improved process-based modeling of nitrogen and carbon cycles in animal-crop production systems. We developed novel method for measurement and estimation of greenhouse gas (CO2, CH4, N2O) flux (mass/area/time) from land-applied swine manure. New method is based on gas emissions collection with static flux chambers (surface coverage area of 0.134 m^2 and a head space volume of 7 L) and gas analysis with a GC-FID-ECD. 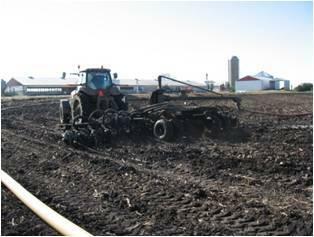 Baseline (post tilling) greenhouse gas (GHGs) emissions monitoring was followed with swine manure application in the Fall of 2012 (pictured) and about 10 weeks of post-application monitoring of GHGs. New method is also applicable to measure fluxes of GHGs from area sources involving crops and soils, agricultural waste management, municipal, and industrial waste. New method was used at the Ag 450 Farm Iowa State Univeristy (41.98 N, 93.65 W) from October 24, 2012 through December 14, 2012 to assess GHG emission from land-applied swine manure on crop (corn on corn) land. Gas samples were collected daily from four static flux chambers. Gas method detection limits were 1.99 ppm, 170 ppb, and 20.7 ppb for CO2, CH4, and N2O, respectively. Measured gas concentrations were used to estimate flux using four different mathematical models, i.e., (1) linear regression, (2) non-linear regression, (3) non-equilibrium, and (4) revised Hutchinson & Mosier (HMR). Sixteen days of baseline measurements (before manure application) were followed by manure application with deep injection (at 41.2 m3/ha), and thirty seven days of measurements after manure application. Preliminary net cumulative flux estimates ranged from 115,000 to 462,000 g/ha of CO2, -4.65 to 204 g/ha of CH4, and 860 to 2,720 g/ha N2O. These ranges are consistent with those reported in literature for similar climatic conditions and manure application method. Greenhouse gases (GHGs) were analyzed in the Air Quality Laboratory (ISU) using dedicated GHGs gas chromatograph. 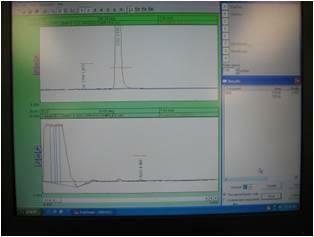 The picture above shows an example of gas sample analysis for CO2, GH4 and N2O. Each ‘peak’ represents one of the tagget GHGs. Gas concentrations were used in a mathematical model to estimate GHG flux (mass emitted/area/time). 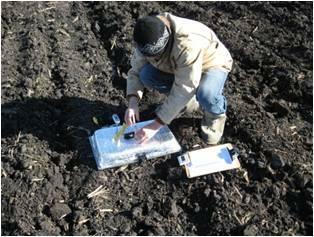 Spring 2013 measurements of GHG flux from land-applied swine manure are planned. The spring study will follow the protocols developed for the Fall 2012 season. Estimates of the Spring and Fall GHG flux will be used to develop GHG emission factors for emissions from swine manure in Midwestern corn-on-corn systems. Emission factors will be compared with literature data. We would like to thank the National Pork Board for supporting this research.